The kids are FINALLY going back to school tomorrow!!!! I am SO glad cuz everyone is really beginning to get on everyones nerves.....lol. So they are all nice and tucked into bed EARLY tonight and I am sitting here bundled up drinking a nice hot latte and have been looking for Valentines day ideas for Jesse's class and decor to kinda spruce up things here in the house. If anyone has any cute ideas or suggestions let me know...at this point I am open to almost anything!!! I have a page ALMOST ready to share with you......all thats left is the journaling, but it happens to be the most important part of the layout! I need to use the printer but since we reinstalled windows on Bobs computer we haven't added the printer back.....he doesn't want it readded cux he never uses it but I have windows 7 on the laptop and it keeps telling me there is a compatability issue. So Im gonna wait til he is gone tomorrow and put it back on his computer anyway......lol The fun part will be seeing how long it takes him to notice!! Isn't it lovely???? 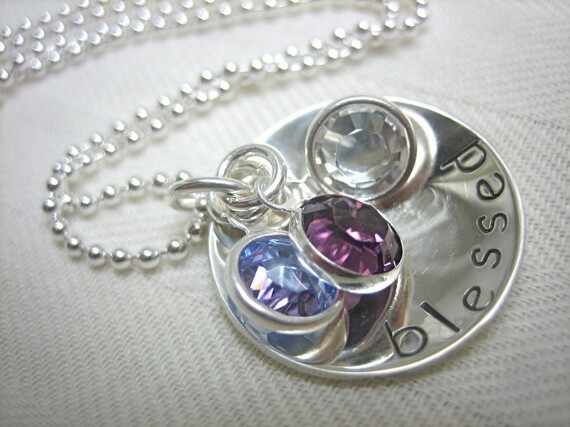 She let me pick out what I wanted stamped, the font, and I got to choose FIVE birthstone crystals!!!! FIVE!!!! And how many boys do I have class??? FIVE!!!! I am so thrilled to have been chosen. I stuck with "Blessed" and this font........I can't wait to get it!!!!! Oh......and here is my Nevaeh photo of the day....which may or may not become a regular feature here.....lol. This is her and her BFF :) Ok......week old babies don't have BFFs yet. 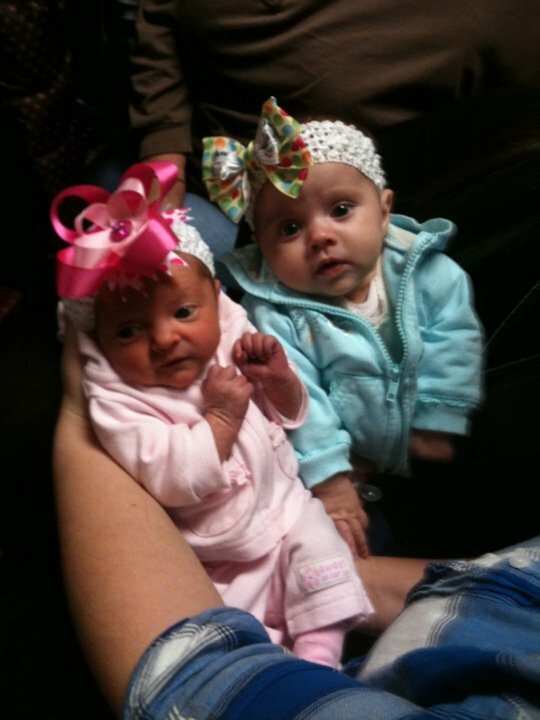 This is her Mommy's BFF's little girl Diana who is 2 months old.....Nevaeh is the one with the bigger pink bow.....just cuz thats how my family is, we overdo everything......lol. Didn't have to think hard about this one......Sling Blade with Billy Bob Thornton......LOVE that movie.....and it makes me cry every single time I see it. And Bob does an eerie Carl Childers impression that cracks me up! Its a great movie and the little boy is amazing in it. A close second would have to be Forrest Gump....which also makes me cry......lol. There are a couple of horror movies I will watch over and over again too.......anything by Rob Zombie, love his version of Halloween and I almost know The Devils Rejects lines by heart.......lol. n OHHHH and Misery!!!! Kathy Bates totally rocks as a psycho......lol. I know all the words to that one too!!! Im loving this challenge and hope at least one person is enjoying learning something about me other than you can't take me anywhere......lol. LOL sometimes its hard to pick just one movie isnt it??? cute little girlies, they both look so petite!